The fact that it's almost always expected that an Asian bride will wear some shade of red on her Big Day was the reason we dressed our model Tia Ward in this exuberant Tarun Tahiliani design from boutique Aashni + Co. Sometimes, it's nice to break with tradition. On the catwalks of Mumbai, New Delhi and Lahore, designers have been championing a palette of fiery oranges and yellows for summer. The fresh, sunny shades make a huge impression straight away, and teamed with the rich, brocade blouse and heavily embellished skirt of gems and zardosi on the skirt, truly reflects the modern bridal love story. These options provide a change of track from the expected maroons and crimsons. While red has a timeless place in the bridal colour palette, a modern cross-cultural bride should be open to explore and surprise. With summer finally here, we decided to strip back the makeup for our cover shot. The Khush Creative team wanted a beauty look that works with the outfit, rather than one that fights for attention against it. Even if you're not having a beach wedding, emphasising your natural beauty will keep you from looking too 'done' and out of sync with your surroundings in wedding snaps. Bring out (or fake!) your sunkissed glow by mixing a lightweight foundation or a BB cream with a few drops of highlighter. Keep contouring light, and eye and lip colours one or two shades away from your original colouring to keep you looking like the all-natural girl next door. Cream blush gives a gentle glow to cheeks, while iridescent gold and soft brown shadow on the lids gives subtle definition. A bride can't frolic freely on the beach if she's weighed down with ornate jewellery, so we took the pared back approach we had with beauty and applied it to jewellery too. However, some accessorising is always necessary, so we took cues from the exquisite outfit and chose traditional Indian heritage jewellery to round off the look. 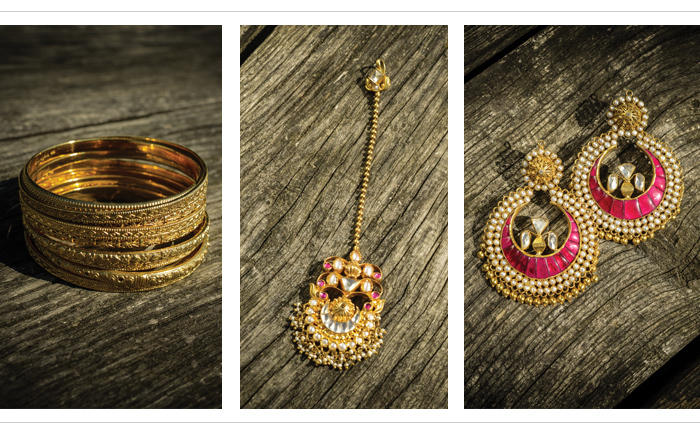 These pieces are from Amrapali Tribe, the latest collection inspired by the tribal jewellery of Rajasthan. The Khush Creative team carefully chose pieces from this range to partner the exquisite embroidery on the Tarun Tahilani lengha. The antique gold jewellery and its intricate craftsmanship made this a perfect choice for our summer cover. Amrapali, one of India’s, most prolific jewellery houses, is fast becoming a growing influence in the west. During a 35-year history, the brand has served royal families and society’s elite, as well as discerning gem lovers and jewellery connoisseurs. Amrapali offers a fresh perspective on east meets west and showcases the exquisite skills of the artisans of india. Pieces are fine and feminine without loosing Amrapali’s heritage look.